The practice of nasal irrigation, known as Neti, has been used by practitioners of Yoga and Ayurveda in India for centuries. Use this 8oz bag with your nasal pot and lukewarm water. 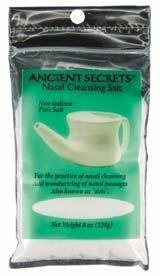 If you are one of the many whose nasal passages are affected by pollution, dust, pollen and other irritants, you will benefit from this gentle and effective technique.